After all, I have terrible ideas and am historically irresponsible. A quick search of the internet by Hawaii would have revealed this and more. So the fact that Hawaii failed to avail itself of a simple online background check before allowing me on her beaches demonstrates negligence on her part, and everyone knows negligence = culpability. It started innocently enough, as it always does. I was visiting my daughter who’s at college in Hawaii. I do this on occasion because I’m an excellent mother who cares about her kid’s wellbeing. I do this so I can cook Abby a few well-balanced meals. I do this because I am generous, kind, and involved, and it has nothing to do with the fact that she picked Hawaii for school, where she lives in a condo with a rather lovely pool close to the beach. I’m certain I’d visit just as often if she’d gone to school in Saskatchewan. So I was visiting my kid, and we decided to take a few mother/daughter twinsie pics. You know; twinsie pics… where you take photos together and see if people can tell you apart. We’ve been doing this for a few years now, ever since Abby wanted to take a dance photo — accomplished dancer that she is — in a Japanese garden. She wanted the photo, but she was too embarrassed. I told her it’s OK to be embarrassed. I’d be embarrassed, too, if I had a mom like me who’s an even better dancer than her. I mean, that’s got to be hard for her, you know? To have a mom who’s so young, beautiful, and athletically gifted? Hard row to hoe right there, with me as a mama. Since then, we’ve taken dozens more. And then last fall, I decided to start duplicating her Instagram feed, because WWJD, amirite? But in all our efforts, something was missing. Something made it clear we’re not quite exactly alike. It took me a long time, but I finally figured it out. MATCHING OUTFITS, friends. We needed matching outfits. Like, duh. And what better way to match than to wear the EXACT SAME THING? I really don’t know why I didn’t think of it before. I mean, Abby and I share clothes all the time. Obviously. So I asked — and received permission — to wear Abby’s swimsuits this time to duplicate her Insta feed. After all, what’s a little sand in your crack(s) when you’re giving the world a gift of unparalleled beauty? …like the current volcano in Hawaii, such that something had to give. That clasp gave with such force, it flung the top up into my face. …one second tastefully and demurely contained; the next, bursting forth to wreak havoc on the innocent. 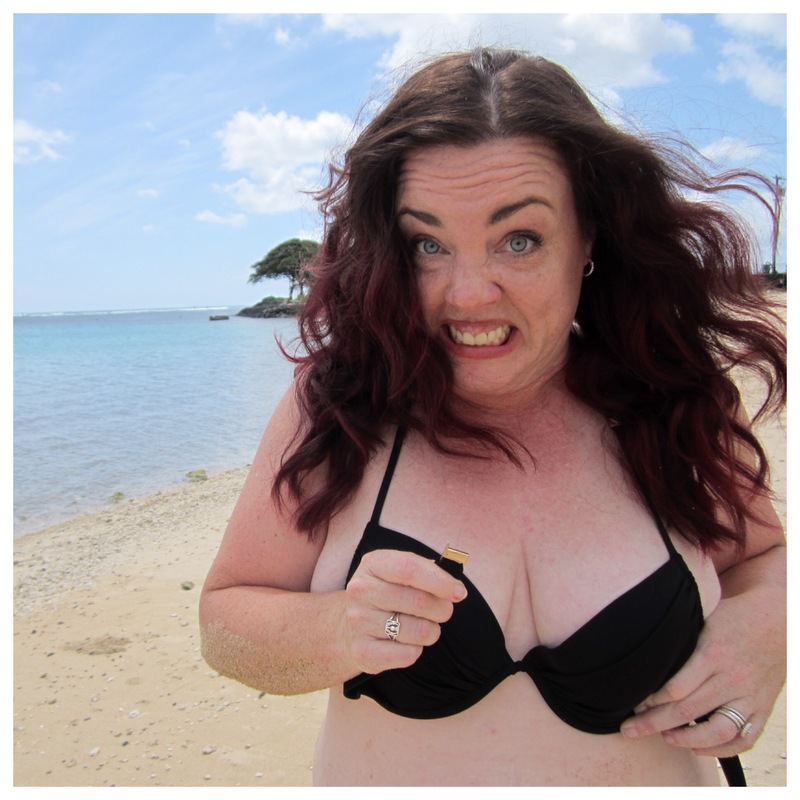 Which is how, dear friends, I ended up flashing a Very Public Beach in Hawaii. And why Hawaii owes the very sweet young families and lovely older couples there an apology. P.S. Abby is now the proud owner of a brand new black bikini top to replace one destroyed in a terrible and mysterious accident. P.P.S. More twinsie pics are on their way soon. Cover your eyes. P.P.P.S. Join my email list at the bottom of this page. You’ll receive blog posts straight to email, as well as other exclusive content, so you won’t ever miss a thing. In fact, as soon as you subscribe, I’ll send you a bonus story, exclusive to email. A sequel, if you will, to The Day I Pooped My Closet. This one is The Day I Peed My Office. Greg says this is more of a threat than an enticement. I say you’re my people; you totally get it. Oh Beth! You are a brave & beautiful woman. Your daughter has nothing on you. I will keep comeing back to this post when I need a laugh. as everything i ever read on here is. This reminds me of when I took my kids to Disney for that once in a lifetime vacation. We were on the 7 dwarves minetrain when my bra literally exploded off my body. The front clasp disintegrated. I had to go to the dress store to ask if they had a safety pin, which one castmember did. They then gave me a ginormous pin that said “I’m celebrating!” The safety pin blew on splash mountain. Beth Woolsey: simultaneously making us laugh and removing the power of shame by writing about her life. Thank you. I wonder when my 13 yo daughter will let me start taking “twinsies!” pix with her…. right now I am so embarrassing. Thanks for giving me goals! I just absolutely adore you. This is amazing. This kind of cheap clasps should be taken out of production – maybe Hawaii could sue them to help cover their expenses for their apology-making-to-all-the-people? You and your family are so brave. You deserve chocolate and trophies and I hope your kids all go to college in Hawaii! I WOULD PURCHASE THAT CALENDAR. Please include “inspirational” quotes. I agree. Ad settings are all new to me (I am Beth’s tech support). We haven’t used this style before. I just found where to change the ad frequency and number, hopefully that helps. The goal is to cover the blog expenses, not annoy readers! laughing out loud. no, really. by myself. in my kitchen. I have been following you on FB for years. Oh my… yes, you are among my people. Oh my God, Beth, I’m so excited you’re sharing these! The anticipation was KILLING ME. The blog update looks very nice, and I had no idea you had one in the works. PEOPLE! If you don’t already subscribe to Beth, you really should, because I’ve heard the office pee story, and it is WORTH IT. I love this. So hard. I’m so glad Hawaii is simply terrible at background checks. Hahahahaha hahahaha! I needed that. Thank you!